If you think you know how to say “Japan,” 邦 comes as a surprise. In Japan, native speakers call each other 日本人 (Japanese), but in other countries they could also use 邦人 (overseas Japanese national). Crossing borders means that vocabulary changes, along with currency and converters! 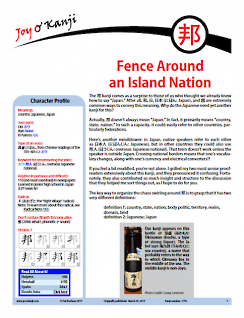 The essay compares 邦 with other kanji for "Japan," looking at the nuances 邦 lends to words. pp. 2 and 6: Fixed broken links. July 17, 2015: p. 10: Fixed a typo. Mar. 29, 2013: Originally published.